The days are longer with increased daylight and now is the time to begin planning your outdoor living space and get back to basking in the great outdoors. But where to begin? Designing a splendid outdoor deck for your family and friends to chill this summer may initially feel intimidating, but with preplanning and basics, you can design the outdoor deck of your dreams. Cedar softwood decking provides the idylic warm and luxurious aesthetic for any deck. With different stains to choose from, cedar decking also merges seemlessly with nature already outside your door. You want to get the most out of your leisure time. Inhale the fresh air with these fresh outdoor deck design ideas and start celebrating! First, consider your needs. Do you want to incorporate an outdoor kitchen, hot tub, or cosy reading area? Perhaps a fire pit to enjoy stargazing and socializing on warm summer evenings? Your new cedar deck can be as complex or simple as you like. Visualizing outdoor space can be daunting so invest time in scanning online deck pictures, collecting inspirations along the way. Pinterest and Houzz.com are perfect sites to gather ideas of what interests you, as well as what is possible (or not) in your space. Walk through where to place furniture and leave space for walkways in the deck area and start rough measuring. If you’re hiring a contractor, he or she can take care of building permits and codes. If not, it’s up to you as the homeowner to check with the city and apply for permits and ensure building codes are followed. Don’t be afraid to ask staff for help along the way. Accept that your deck design may change as you go along. Calculate a general budget to help avoid unpleasant surprises at the end of the build. Tools, materials and deck décor add up quickly. You may want to contact local authorities to mark underground utilities like gas lines to avoid upsetting and expensive deck design mistakes. You don’t need to be an artist to sketch down rough plans for furniture, plantings, and BBQ placement to help actualize your deck space. Also think about conveniece and flow of the indoors to the outdoor deck. Ease of access and an outdoor kitchen and dining area that makes sense for your needs are primary points to consider. Contemplate outdoor scenes and whether they need to be disguised with creative greenery or left free of deck railing for unobstructed views. What type of plantings do you desire around the deck? Select potential trees, flowers, and plant containers; then, make note of required space. Additionally, consider shade and sun. You’ll likely want a covered seating area and a modern cedar pergola can do the job. Or perhaps an awning or umbrella will suffice, with spots for hanging planters and strings of patio lanterns. Depending on the area, you may want to have multi-level decking that creates different spaces and flow for a seating area and a hot tub, for instance. A water feature also adds a touch of nature with the soothing sounds of running water. Serene koi pond with bench seating, anyone? Furthermore, privacy screens are essential for comfort and intimacy from neighbours or less than spectacular views, so design seating areas carefully. Remember to go big rather than small—you’ll want your deck to be spacious enough to place outdoor items without being cluttered. Good lighting delivers the relaxing or romantic mood people appreciate in the evening. 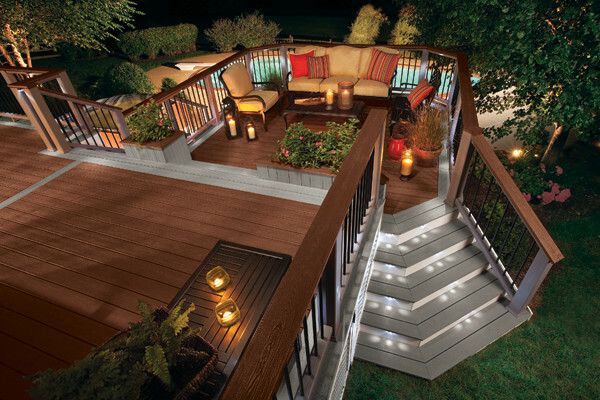 Consider where you want garden and deck lighting for optimal ambience. Undoubtedly, creating a luxurious outdoor living space makes it easy to take full advantage of warmer seasons. Since cedar is naturally resistance to decay, it’s an ideal choice to become the foundation of your outdoor deck and withstands harsh weather. With pre-finished, custom cut cedar decking, you can select from Yellow or Western Red Cedar. Staff at Longhouse are happy to help you find what suits your needs best. Soon, when you step out on your new deck, you’ll smell cedar wafting in the air and know you’ve attained backyard bliss.